Hope you like this one. 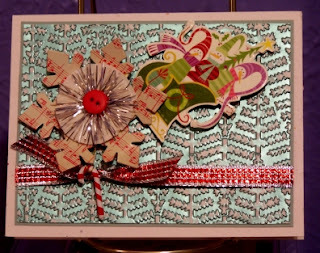 I used an embossing folder called Evergreen on some white core cardstock. Then I sanded the raised areas. I love this technique and the effect it turns out. I added some stashed embellies and ribbon and called it a done deal! Hope you enjoy peeping in on my creations as much as I love bringing them too you. Remember, no matter what your creative style you can always try something new!